Featuring patent pending honeycomb soleplate and unique active ironing table, the FashionMaster is Miele first steam ironing system. Its patented 1-2-Lift System allows the table to be both raised and folded away effortlessly. 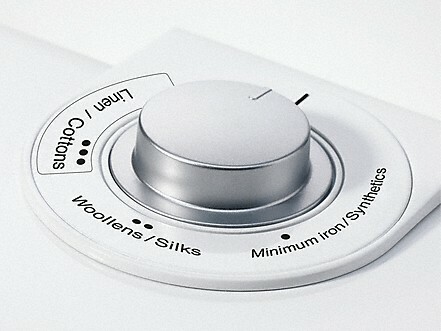 Other Miele-exclusive features and highlights include an automatic descaling and rinsing function and the steamer. With the honeycomb soleplate, the hand iron ties in with the success of the honeycomb drum on Miele washing machines and tumble dryers and nicely rounds off Miele laundry-care range by significantly simplifying the job of ironing compared with conventional models. Shorter ironing times, more time for yourself! You can smooth very different textiles and laundry items conveniently using Miele rotary ironers – faster and easier than with any steam iron. Depending on the laundry type, you need 30 to 50% less time than when ironing by hand. This allows you to gain time for the nicer things in life. Our effective means against creases and wrinkles: Do you think that rotary ironers are old fashioned and inconvenient? If this is the case, then you have never worked with a rotary ironer from Miele. It will not take long for the benefits to convince you otherwise. Ironing has never been faster or more convenient. You can save yourself a lot of work compared to using a conventional iron ... and up to 50% time. And you also don’t need to send your laundry out for ironing. Discover the Miele rotary ironers for relaxed laundry management. The relaxed method of ironing: Effortless ironing while seated. Movement of the roller is triggered by a smooth-running foot switch; the heater plate is lowered onto the garment and applies pressure. An ergonomic seated position reduces strain on your back and keeps both hands free. Miele market research surveyed our customers and discovered that 95% of all buyers of a Miele rotary ironer are satisfied to very satisfied. Folding mechanism makes storage easy: After use, a convenient folding mechanism ensures space-saving storage. 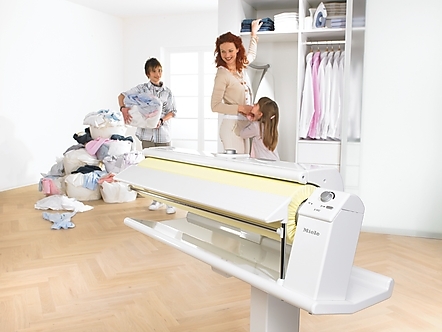 Folded-up, the rotary iron's compact footprint allows for storage in closets or laundry areas. Thanks to four stable castors, the rotary ironer is easy to transport. 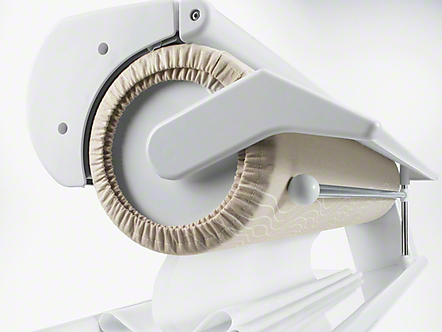 Convenient handling: The all-round free roller end simplifies ironing of difficult garments such as skirts or shirts. 3 heating elements for optimum heat distribution: Heating power can be set in accordance with the care label in the textiles, which means that the fibers are treated gently. The heat is distributed optimally over the complete area thanks to the three heating elements. This ensures optimum ironing results. Lots of room for freshly ironed laundry: After ironing, the laundry falls down in loose pleats in the large storage space - free of creases. Miele Rotary Iron Barrel Cover "Moonshine"